Welcome to the neighbourhood is an invited international residency programme where five selected artists spend two weeks working and living in the local town of Askeaton, Co. Limerick. Now in its sixth year, this residency programme, co-ordinated by Askeaton Contemporary Arts and curated by Michele Horrigan, was developed from an initial desire to provide a centre for contemporary art outside of the urban environment, and to bring contemporary art to wider ‘non-art’ audiences. Oswaldo Ruiz, video still, Askeaton, Co. Limerick, 2011; image courtesy Askeaton Contemporary Arts. There is no remit for the artists to create work in relation to the location of Askeaton, however, the participating artists in this latest edition have all chosen to do so, producing work in response to the direct environment, the local community history or the historical architecture of the town. The resulting output is exhibited at the end of the residency period in communal spaces around the town. Influenced by the history of the Franciscan Friary and the practice of the order, Elaine Byrne’s film documents simple interventions she pursued with the friary’s ruined architecture. By placing green transparent vinyl screens against the window frames, she references the Franciscan monks belief that green was a contemplative colour. Historically, the monks cultivated a well-maintained grass lawn in the courtyard of the cloisters of the Abbey, which was regarded to instill pious reflection. Again this ideology is re-manifested as green fabric attached like curtains to the cloisters arches. Byrne has captured this sensitively on film; the gentle movement of the fabric casts a green hue onto the ground and surrounding stone walls, transforming the space. 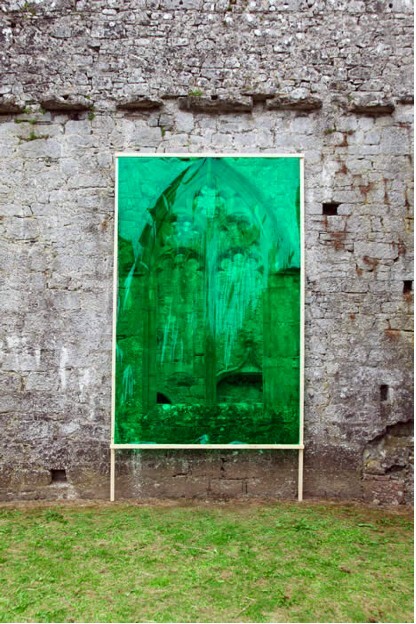 Elaine Byrne, Franciscan Friary installation, green vinyl, wood, 2011; image courtesy Askeaton Contemporary Arts. Next door, located amidst the wood veneers of a closed down hair salon, Oswaldo Ruiz’s film plays on a flat screen. Ruiz is a Mexican photographer and filmmaker who cites Seamus Heaney’s “Sweeney Astray” as the influence for this work. The poem is based upon the re-telling of the legend of the medieval King Suibhne who, having threatened Bishop Ronan, was cursed to behave like a bird and roam the Irish countryside as an exile. In Ruiz’s film, he traverses the uninhabited urban spaces at night, shooting still images of the derelict and abandoned spaces around the town. Illuminated only by the streetlights, the cinematography of each seemingly banal scene is engrossing. Among local advertising notices stuck to the salon door, Ruiz also presents watercolour interpretations of the recounted tale. 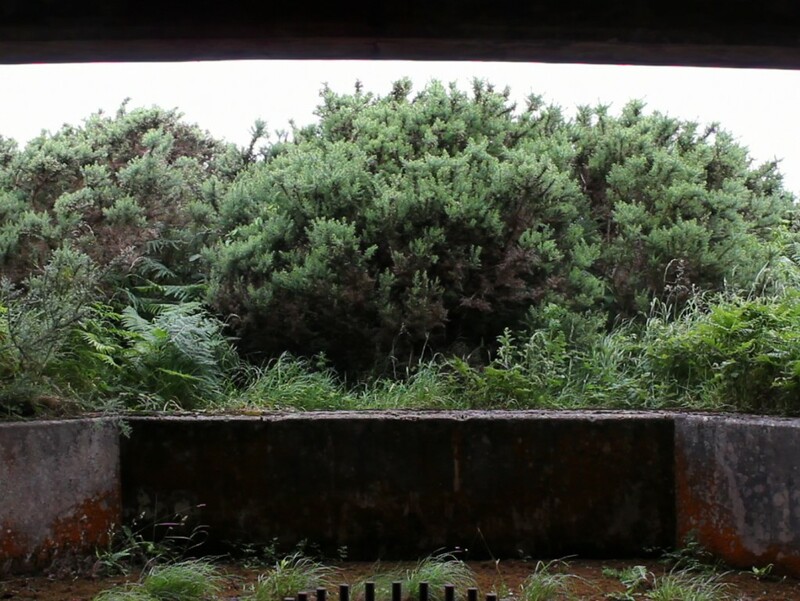 Allan Hughes, video still, pillboxes, Askeaton, Co. Limerick, 2011; image courtesy Askeaton Contemporary Arts. Located in the Civic Trust building, Belfast based artist Allan Hughes’ work considers moving image and aural methods of representation. For the residency, Hughes focused on the remaining pillboxes located in and around Askeaton. Pillboxes were strategic defense fortifications located along the Shannon estuary, designed as vantage points to monitor the river Shannon for German u-boats during World War II. Constructed from concrete, these could house up to two volunteers of the Local Defense Force (LDF) and the Local Security Force (LSF) appointed to keep look-out. Hughes interviewed three men from the locality about their experiences in the volunteer forces during the 1940’s. These conversations are replayed as an audio narrative from a speaker on a mount stand. Adjacent to this, a tv monitor shows alternating views of the River Shannon from the interiors of pillboxes, and is spliced with footage of its rough waters. By recounting the experiences of the volunteers as two separate works, Hughes seems to comment on the fractured nature of historical narratives. 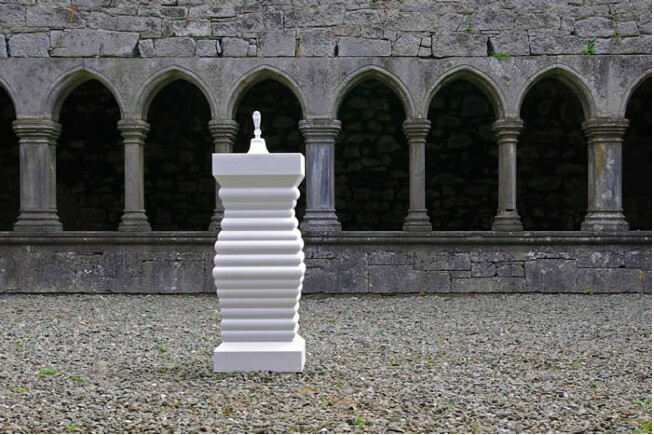 Alan Counihan, a sculptor who traditionally works with stonemasonry, enlisted the support of the local aerobord factory Kingspan to produce a site-specific work in response to the architecture of the ruined friary. Counihan carved a white plinth from aerobord, and installed it in the open courtyard of the friary, with a glass bell on top. The use of the lightweight, commonplace aerobord is a playful contrast to the fragility of the glass bell. The shape of the plinth echoes the formal Roman architecture of the cloisters arches, yet the durability of the sculptural materials negates their functionality in the open space – a possible indication towards the slow decay of the friary itself. Amanda Gutiérrez, transcribed screenplay, Askeaton, Co. Limerick, 2011; Image courtesy Askeaton Contemporary Arts. Chicago-based Mexican artist, Amanda Gutiérrez’s work looks at social, political and personal effects of migratory displacement. For this project she conducted separate conversations with four individuals from different native backgrounds who have settled in Askeaton. They are known only by their first names: Rita (India), Marianne (Denmark), JJ (Limerick), Raymond (England – of Nigerian parents). 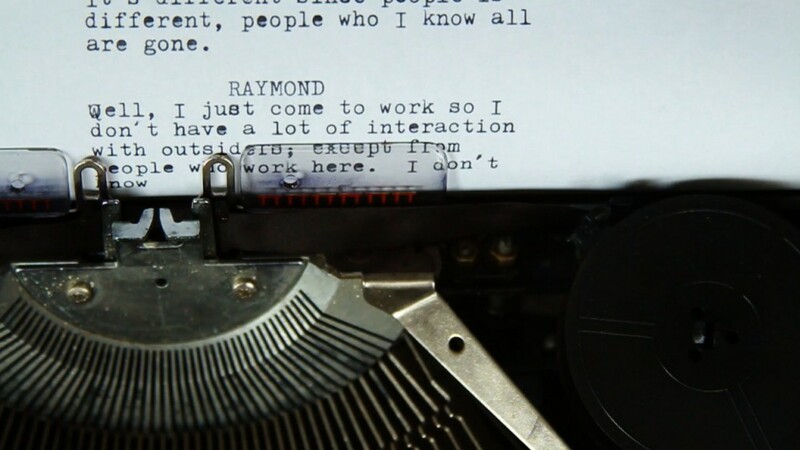 The conversations are transcribed into a screenplay, printed onto A4 sheets of paper, and pinned to the green felt notice board at the entrance of the local community hall. Different categories within the screenplay parallel similar experiences of each of the individuals through their emigration, or immigration into the country. Under different headings – Labour, Interaction, Homesickness, Motherland – each participant describes their hometown. Departure describes their reasons for emigrating or immigrating, and Adaptation discusses their final assimilation into their adopted community. On a small monitor in the corner of the entrance, anonymous hands type the accounts of each character. On the stage of the community hall, footage of the local countryside is projected onto a suspended screen. The screenplay, read by a local Askeaton resident, serves also as an accompaniment to the film. Alan Counihan: aerobord, glass, installation, Friary, Askeaton, Co.Limerick; Image courtesy Askeaton Contemporary Arts. The different modes of presentation, and the format of a screenplay, converted to video raises questions as to whether the characters are in fact real or fictitious and if the emotions expressed in text and through audio are unique to these four individuals or represent a universal feeling of displaced people. The fact that we are never presented with their visual identities or that their original sentiments have been presented by a third party, mirrors the act of displacement and establishes their loss of identity through immigration. I was impressed by the well-considered and resolved work featured in this edition of Welcome to the neighbourhood. This residency provides an alternative model for a community art initiative where social engagement between the local community and the artists is achieved through other methods. The success stems from the artistic freedom given to artists, and through the community’s support and interaction with the artists to facilitate the production of the work, often providing the source material with which to begin a discourse. May it run and run. Ruth Hogan is an Irish freelance curator based in London.